Australia's Govener General Quentin Bryce, center, and Melbourne Archbishop Philip Freier right, leave a church service dedicated to the victims of last weekend's fire, at a church in Whittleseas. WHITTLESEA, Australia — Australians mourned the victims of deadly wildfires at church services across the country Sunday as news emerged of a class action lawsuit against a power company over the cause of one of the blazes. Residents of towns in the 1,500-square mile (3,900-square kilometer) fire zone gathered at church services Sunday to pray for the dead and seek comfort from each other. The scene was repeated at churches across the country, which has been deeply shocked by the tragedy. 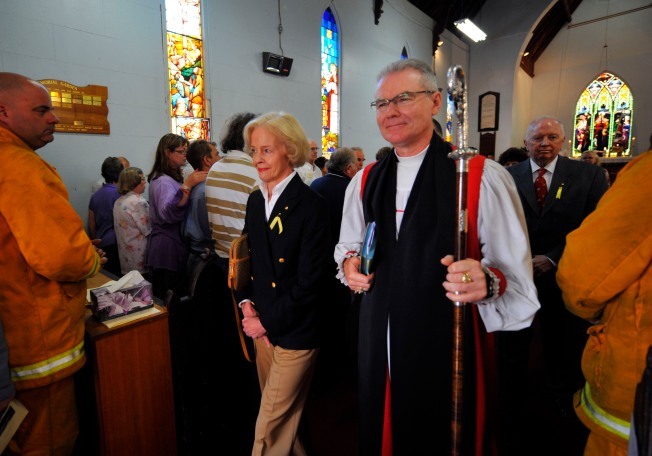 At Whittlesea, a town about 60 miles (100 kilometers) north of the state capital of Melbourne, about 200 people attended the Whittlesea Christ Church for services led by the Archbishop of Melbourne, Philip Freier, and attended by Governor General Quentin Bryce. "As a brigade and the community, a service like this brings everyone together," Whittlesea volunteer firefighter Jeff Rowden said after the church service. "I think it's good to be around people who shared the same thing and know what you've been through, so we can get back to our normal lives." Visitors from outside the fire-ravaged area also attended to show support for the families affected by the disaster. "I didn't know anybody directly affected by the fires, but this is something that's touched the hearts of everybody," said Sharyn Mitzzi, who drove up from Melbourne with her husband, Raymond. They heard the vicar on the radio last week and decided to come to Whittlesea to offer their home to an affected family for a weekend respite. Prime Minister Kevin Rudd also attended church services in Victoria and was to tour Kinglake, one of the hardest-hit towns, later in the afternoon. An outpouring of charity has raised more than 90 million Australian dollars ($60 million) in donations to official relief funds. Community Services Minister Jenny Macklin announced Sunday that families whose homes were destroyed would get a $AU10,000 cash payment to start the rebuilding process. The federal and Victoria government have promised millions of dollars more and say a comprehensive rebuilding strategy would be released later this week. Victoria Chief Commissioner Christine Nixon said Sunday that police were aware of the reported class action suit involving the Kinglake fire. She declined to answer directly when asked if police had removed a section of power line and a power pole as evidence.